Rich Hopkins came of age on his abilities as a guitar-slinger and songwriter. His ear-bending way of expression became a rock ’n‘ roll definition of the romantic American southwest, these desert blasts filled with spirited tales, soaring hooks and a warm, beating heart. The songs pump blood in that essential way that says there’s nothing else in life for Hopkins but the song. Think of the music as an aural equivalent of rainwater-etched swirls in sandstone-it’s got timeless unstoppable beauty, and its shape sometimes shifts in graceful ways, but it’s always formable, always heavy. Yes, that might sound like bio-ready hyperbole, but hold on: Trust the sizable audiences the world over who have long regarded Hopkins as the essential lifeguard of „desert rock,“ audiences who have responded to Hopkins‘ guitar heroics and scruffily quixotic songs since the storied, late-’80s and ’90s albums he made with that rowdy (now-mythological) major-label combo he co-founded called The Sidewinders (later rechristened The Sand Rubies), and then his own Rich Hopkins and the Luminarios. Nearly two-dozen albums all told, each persuasive and subtly dramatic, like a mounting monsoon storm, and also fun as hell. Along the way he met Texas born-and-raised Lisa Novak, another gifted singer/songwriter whose shrewd yet empathetic storytelling rivals good short-story fiction, and whose voice and songwriting resembles a dusty mix of Emmylou Harris and Aimee Mann, and that’s considering just how hallowed (and odious) such comparisons can be. Hopkins and Novak partnered in song in ’06, and wedding bells ensued. The union revealed a mastery of songwriting-they collaborated on five Luninarios albums-so it’s no surprise that their brand-new album, My Way or the Highway, finds the duo sharing the marquee. Songs see-saw between strident boy-girl rock ’n‘ roll tension and rootsy beauty, with stops at garage, hardened country rock and even hip-hop. Folks, that ain’t easy to pull off. They co-produced the record with the golden-eared Lars Goransson, recorded it primarily in Austin, TX, and some in Tucson, AZ. It boasts a stellar guest list too, including, but not limited to, bassist George Reiff from Joe Walsh’s band, and Alejandro Escovedo’s consistently classy guitarist Jon Sanchez. You can picture yourself lost in dusty arroyos and acres of dry mesquites on songs like the acoustic instrumental „Lost Highway,“ and in the narrative epic „Angel of the Cascade,“ which tells of a Mexican escapade with a redemptive denouement. The Novak-sung pleader „Want You Around“ is drop-dead lovely, a hit-in-a-perfect-world that mixes sweet pop and folk with rock ’n‘ roll and hints of jangly twang. Semi-tender „Come Hell or High Water“ flips a Beatle reference into a treatise on punctured pride, and „If You Want To“ is a country-rockish nod to the great southern rock bands of yore, and features Tucson stars like ex-Bob Dylan drummer Winston Watson. „Meant for Mo“ finds Tucson hip-hop maestro Cesar Aguirre spitting stinging verses about personal freedoms and the song spectacularly highlights Hopkins‘ killer, Neil Young-stranded-in-Sonoran-desert riffs. The musical blend stuns. Then imagine railroad cars marching over high desert plains, through ghost towns and fading truckstops on songs like the hypnotic „Gnashing of Teeth,“ and tender teardrop „Walkaway Again.“ There’s that kind of yearning. In fact, this entire album holds together like some kind of mad, passionate love; pretty perfect in its unpredictable turbulence and sadnesses, and absolutely worth it for the long, dreamy haul, and all those sandstone swirls. 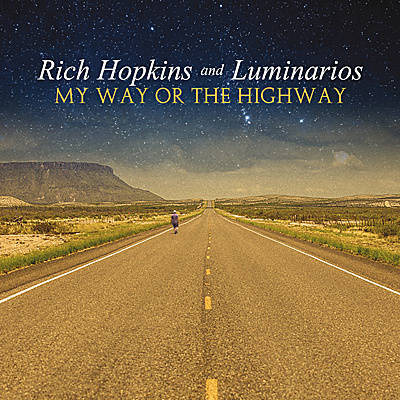 Kommentare deaktiviert für RICH HOPKINS & LUMINARIOS continue to celebrate the desert rock sound with My Way Or The Highway!